One year after the presentation of the Alpine Vision show car, Alpine revealed today at the Geneva Motor Show its production car: the new A110. Combining the timeless Alpine principles of light weight, agility and performance, this mid-engined two-seater sports coupe is true to the spirit of its predecessors and in particular the A110 'Berlinette'. 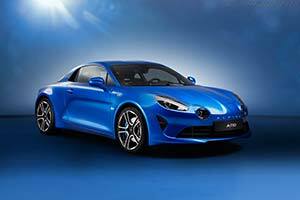 The new car will be built in the Alpine factory in Dieppe and deliveries will start late 2017 in Continental Europe. Deliveries in the UK and Japan will start in 2018. Alpine is back to claim its position in the sports car segment, with only one promise: driving pleasure. The A110's aluminium platform and body are bonded, riveted and welded to provide an exceptionally rigid yet light structure. The A110 is ultra-light at only 1080kg kerb weight (excluding options). Its compact size (4178mm long, 1798mm wide and 1252mm high), optimal weight distribution (44% front/ 56% rear) and low centre of gravity are all dedicated to agility - especially on the type of winding mountain road that made Alpine's reputation back in the 1960s and '70s. Alpine's mass is also concentrated around the centre of the car, with the fuel tank behind the front axle and the engine in front of the rear axle, enabling the driver to feel at one with the car. The A110 is equipped with a new 1.8-litre 4-cylinder turbocharged engine developed by the Renault-Nissan Alliance. Alpine's engineers, together with Renault Sport, have customized this engine for Alpine, with specific air intake, turbocharger, exhaust system and engine tune. The engine has a maximum power output of 252hp and maximum torque of 320Nm. Combined with the low kerb weight of only 1080kg, the A110's excellent power-to-weight ratio of 233hp:tonne enables the car to accelerate from 0 to 62mph in only 4.5 seconds. The engine is mated to a Getrag 7-speed wet-clutch DCT gearbox, with gear ratios specifically developed for Alpine to ensure optimal performance at all times. Aided by intensive use of fluid dynamics simulation, the lightweight, single exit active sports exhaust system in the A110 has been developed for performance and sound quality. The A110 has three driver modes (Normal, Sport, Track) in which the engine and gearbox settings, steering, ESC, exhaust note and driver display are adapted to suit the driving conditions (and the driver's mood). A flat floor worthy of a race car, tried and tested in the wind tunnel. In search of a combination of sleek lines and excellent performance, Alpine's engineers turned to the world of race cars and supercars to optimize the aerodynamics of the A110. With a completely flat floor and functional diffuser under the rear bumper, the A110 combines low drag with significant downforce. This allows the A110 to reach an electronically limited 155mph top speed, while retaining a smooth 'Alpine' profile - without the need for a rear spoiler. Air inlets in the front bumper create a curtain along the front wheel wells, improving air flow around the front wheels and hence reducing drag. With a Cd value of only 0.32, the A110's drag is among the lowest in the sports car segment. The A110 is highly modern yet immediately recognisable as an Alpine. It combines modern design language, materials and technologies with the efficiency of size, shape and profile that marked the original A110 Berlinette. At the front, four independent full LED daytime running lights and the bonnet's central 'spine' clearly show Alpine's DNA. The side profile shows the design's efficiency - bodywork wrapped tightly around the technical parts to minimise footprint and maximize performance. At the rear, 'X' shaped LED tail lights with dynamic turn indicators give the car a highly modern look, while the sloping, wrap-around rear screen reminds us of Alpine's past models. Inside the A110 minimalist, lightweight design merges with a welcoming, comfortable driving position. Top quality materials - smooth natural-grain leather, structural aluminium, carbon fibre - ensure a rewarding driver and passenger experience. The light weight of the A110, combined with double wishbones front and rear, provide a rare combination - excellent handling and performance while at the same time offering great ride comfort and daily usability. Access and egress are designed to be easy, even in everyday use. Driver and passenger space will accommodate all shapes and sizes. In short, the A110 is as at home in everyday driving as it is on the track. Brembo developed the A110's all-aluminium brake calipers. The rear brake system, specific to Alpine, features an integrated parking brake actuator, a world first, saving 2.5kg. Sabelt developed one-piece bucket seats that weigh just 13.1kgs each, with no compromise on comfort.